↑ "List of Provinces". PSGC Interactive. Makati City, Philippines: National Statistical Coordination Board. Archived from the original on 21 January 2013. สืบค้นเมื่อ 30 January 2013. 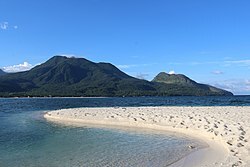 ↑ "About Camiguin Province" Archived 2012-05-29 at the Wayback Machine.. Province of Camiguin Official Website. Retrieved on 2012-04-25. หน้านี้แก้ไขล่าสุดเมื่อวันที่ 18 พฤษภาคม 2561 เวลา 18:26 น.